Being gone all last week without writing anything in normal columns was not only hard but also slightly depressing. I realized how much I love writing the different columns everyday. It gives me some consistancy to my day and what to expect all the time. I really enjoy it and I had no idea till I couldn’t do it like I normally do. So what better way to get back into the swing of things but with an awesome vintage and handmade mobile Etsy shop located right in Grand Rapids, Michigan…only a few hours south of Traverse City! Gets me really excited when I find more local shops. 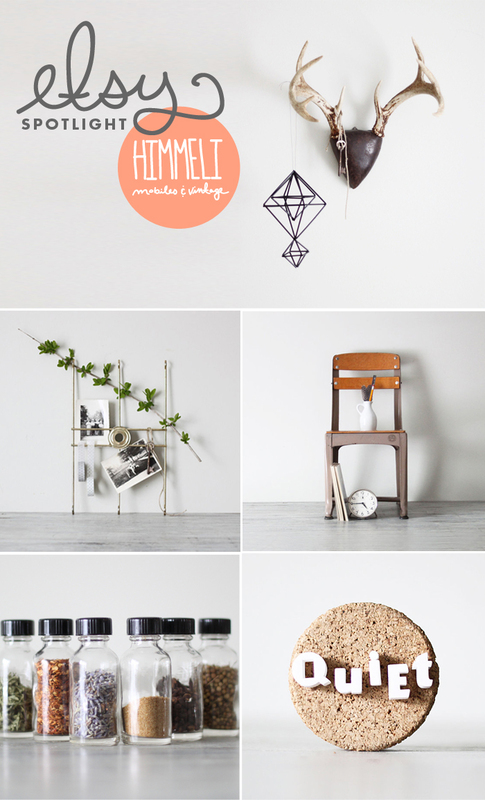 Himeli is full of gorgeous vintage items that would suit almost any style of home. The photography of each item is beautiful and bright. There is a variety of types of items from handmade push pins to vintage spice shakers. The mobiles are amazing and I cannot get enough of the geometry. Can you tell I am obsessed?! Make sure to head over to the shop and see all of her items. I promise you will not be disappointed.